Manufacturer & Supplier of DTH hammer manufacturers. 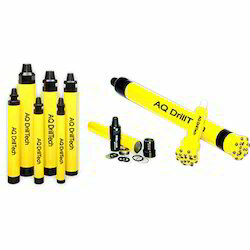 Our product range also comprises of DTH hammers and bits and Tricone Bits. With set industry standards, we are manufacturing and supplying Down The Hole Hammer to our clients. Our products are capable of drilling hole of any diameters or length, our hammers are designed to operate higher pressure levels to deliver maximum energy to drilling bit. It offers great efficiency, low air consumption that reduces fuel consumption, lower operation cost and economy so as to obtain greater profits. No 'back hammering' and blockage etc. Basalt, Limestone, Chalk, Sandstone, Shale and Other Deposits. Looking for DTH Hammers ?